A rather sorry looking sight! Well it can only get better... but not yet, I'm afraid. 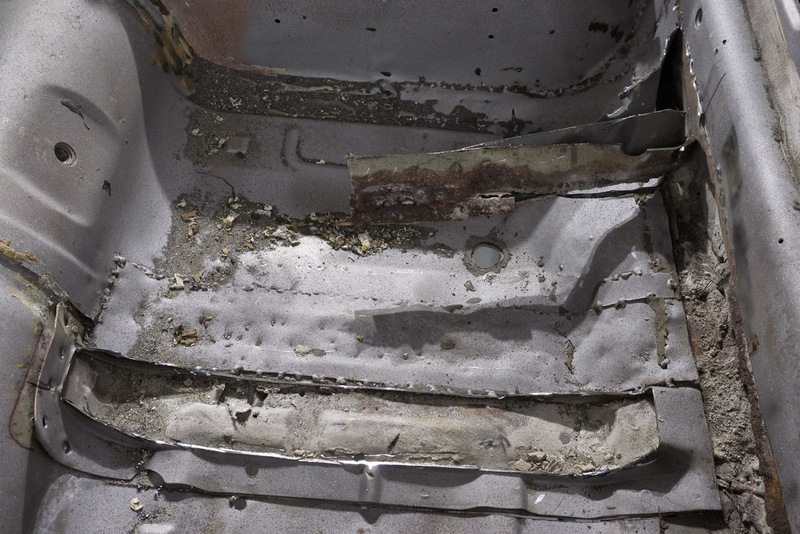 The extent of the removed sheet metal is rather massive at this point and to counter-act the possible deforming, I ratcheted few straps around the cars lover portion. The straps are cheap, but I reckon they will do their job when I sever the last remaining piece and weld it so there are no overlapping sheet metal. The starting point was that I run over the original seam with a nylon brush to remove any contaminants. 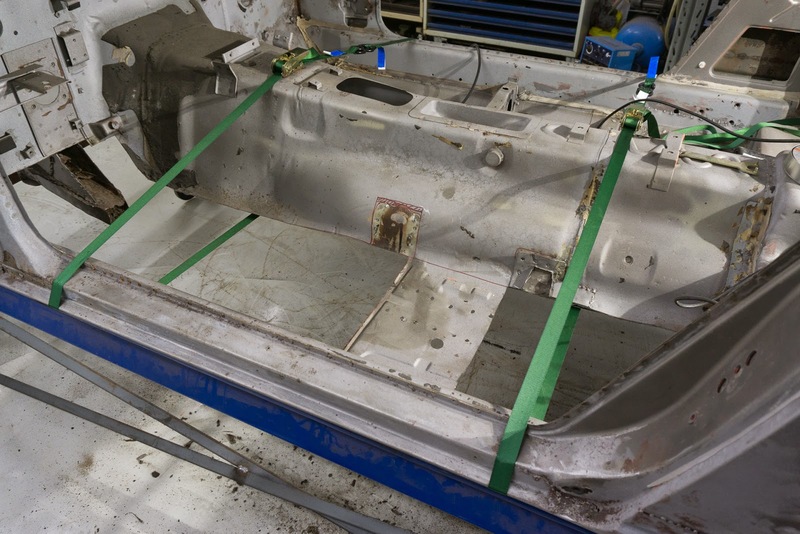 Then I cut through the overlapping parts where they were welded together and tidied the to-be-welded area. After the area was tidy, I clamped the pieces with clamps and hammered the edges level or at least as level as possible. I welded few spot welds between the clamps and in the sides and then removed the clamps. After every few welds, I planished the welds by hammering them against a dolly and grinding them flat. 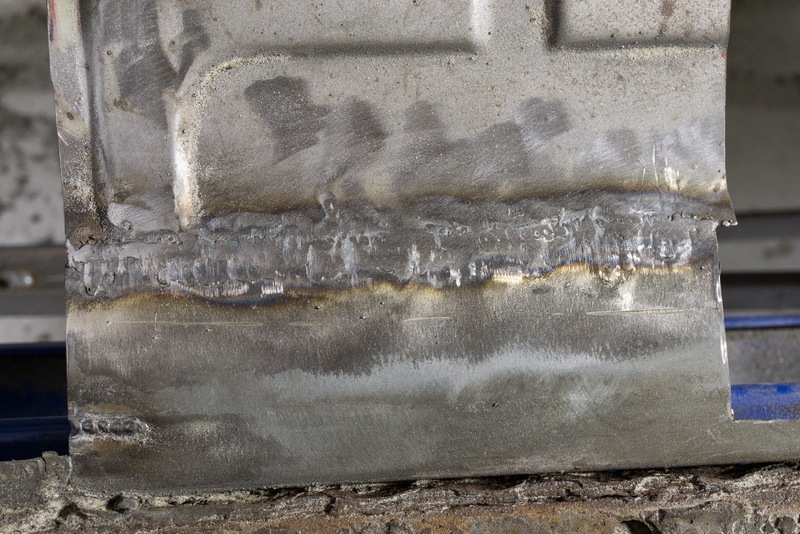 By first hammering the weld, I compressed the weld and eased the temperature deforming. 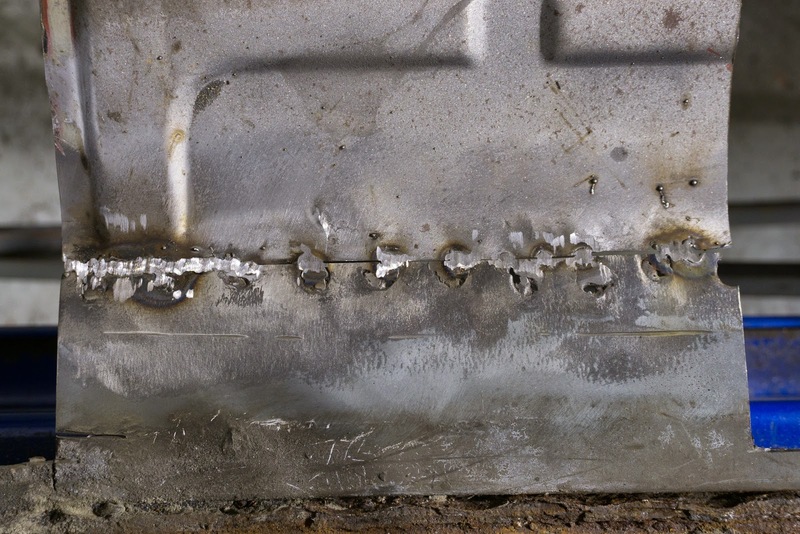 I just kept on adding more spot welds and planishing until the seam was continuous. In this state there were few spots where light shone through. 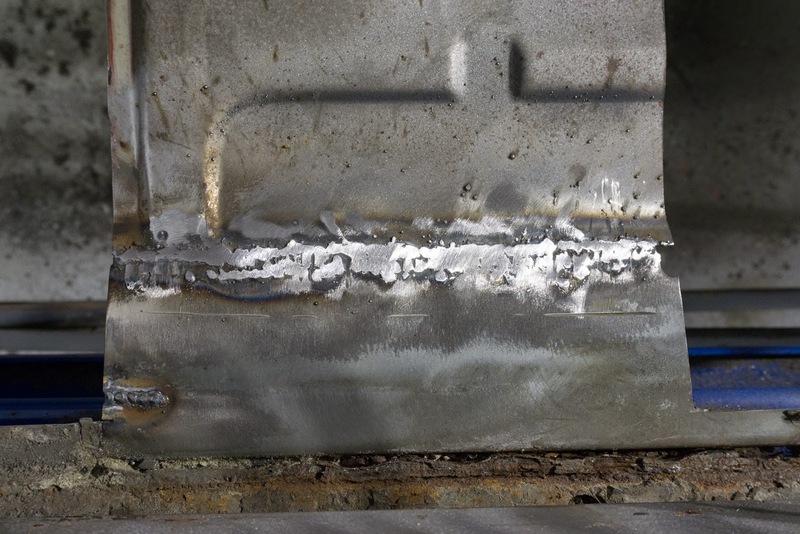 More welds it is then! The finished seam, but I guess some finishing touches should be made. No light shines through when checking for integrity, so I would guess that the seam is also watertight. I welded from downside also to maximise the strength of the seam. 1) The gap between the panels should be equal in every place. 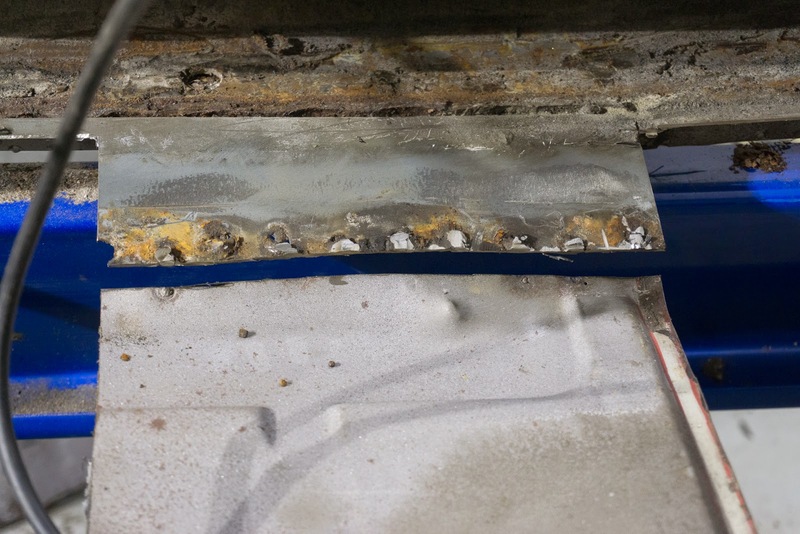 This ensures good penetration of the weld and a nice result. In this first exercise, the panels touched in some places and some places they were 4 mm apart. 2) Better to clean the area very thoroughly. If the area is not cleaned and there is some contaminants left (eg. 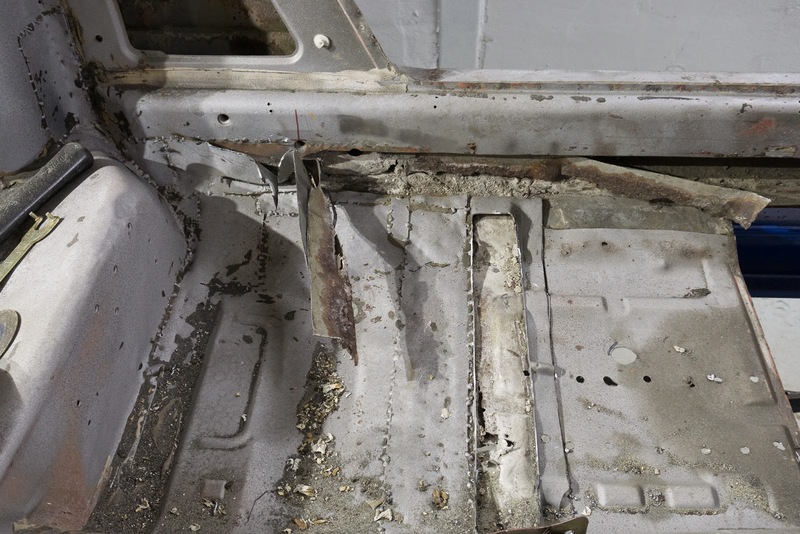 seam sealer, rust, sound deadening), the weld will go straight through like hot knife to butter. Then one must fill the holes with more welds. 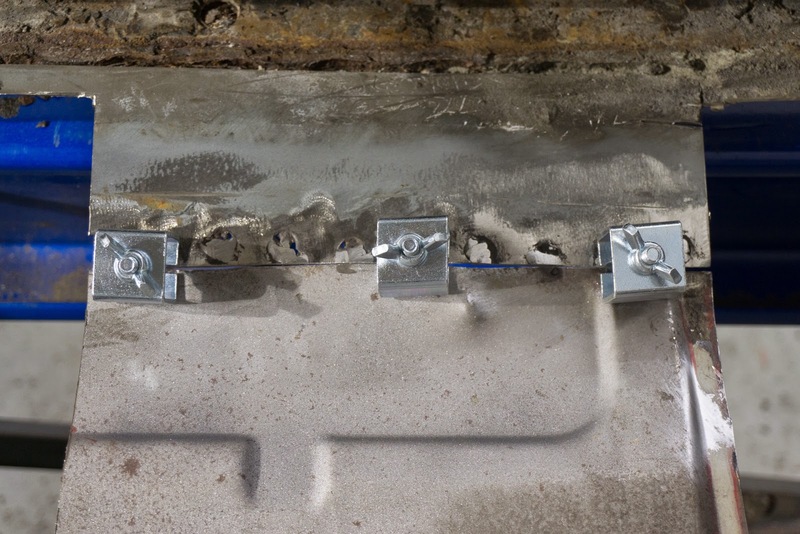 This compromises the quality as more heat is generated and more heat deforming can happen. This time the panels were 1 mm and 1,5 mm in thickness, so they were relatively easy to weld and not prone to distortion. 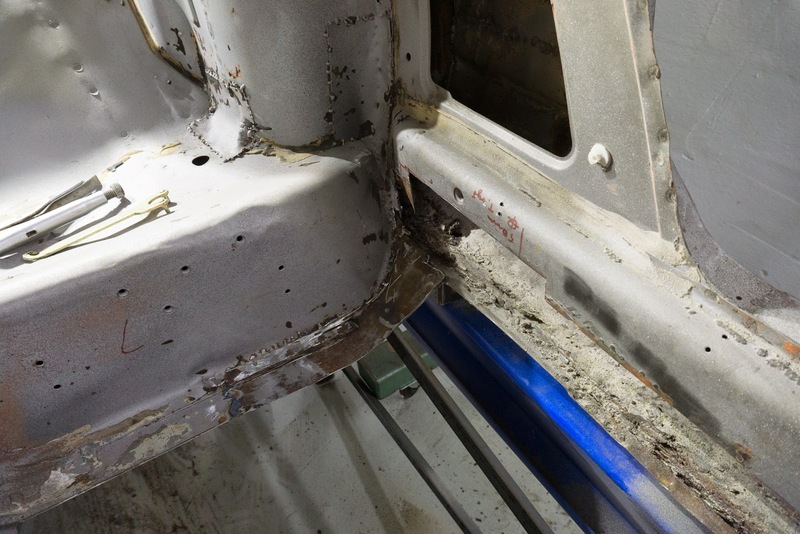 The rest of the rocker panel was in as bad as shape as was the first half, so I cut it open as well. 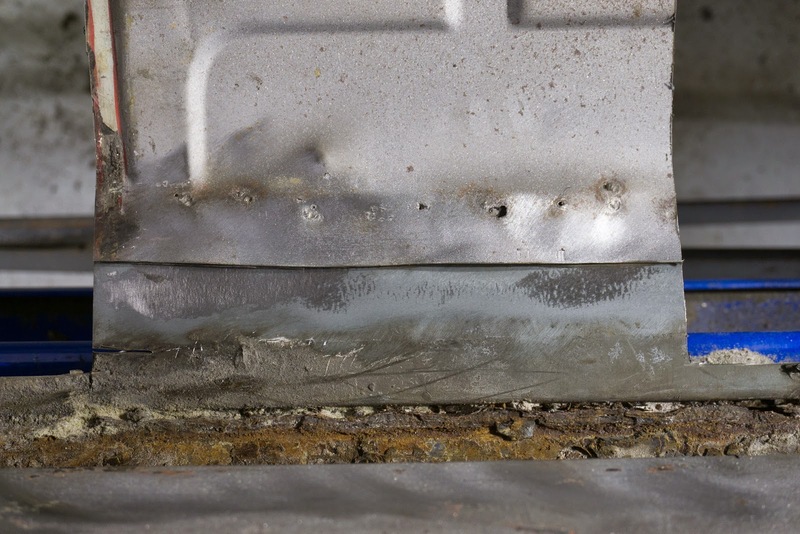 Seam running on the bottom of the rocker panel is in rather bad shape also, as can be seen from the previous photos, but I'm going to run the angle grinder through the center of it and clean up the rust. Either I then clamp the seam closed and weld it or I insert some flat stock in the seam and then weld it shut. Either way, the seam should be in better shape when ready. Luckily that doesn't take much! 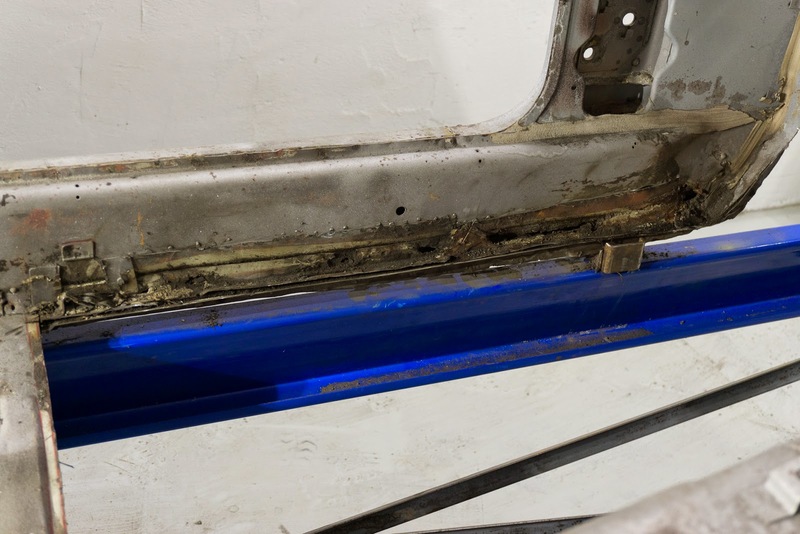 I will be welding safety cage tubing (48,3*2,6 mm ST35.8) inside the rocker panel and weld the coming cage and frame rails to it as well with few extra profiles. 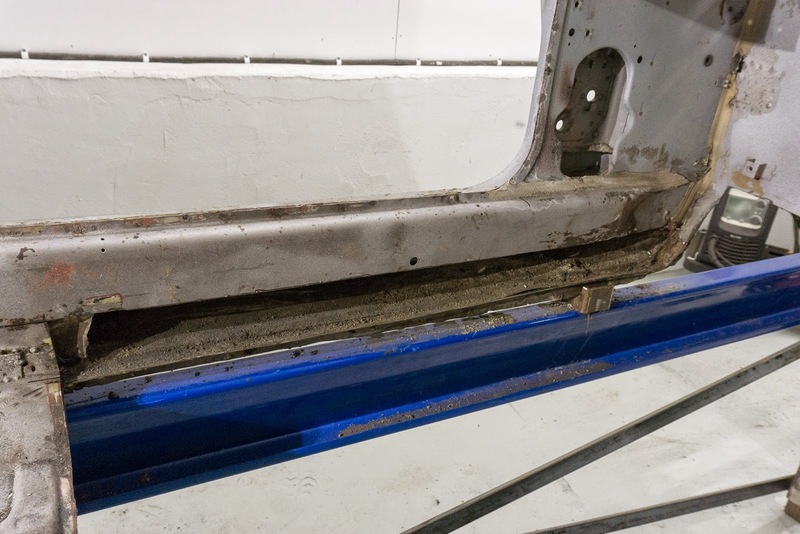 Together they will make additional framing to the car and should stiffen the car rather nicely thus making the car as safe as possible. Also, when done this way, I make sure that the car can and will handle what ever horsepower I throw at it. I'm not sure if this procedure has been done with a Z-car before, but Bad Obsession Motorsport did it with their Project Binky. If it passes with them, it will be accepted in my project also. The added safety features will add some weight to the car, but better to compensate with power than skimp out with safety. 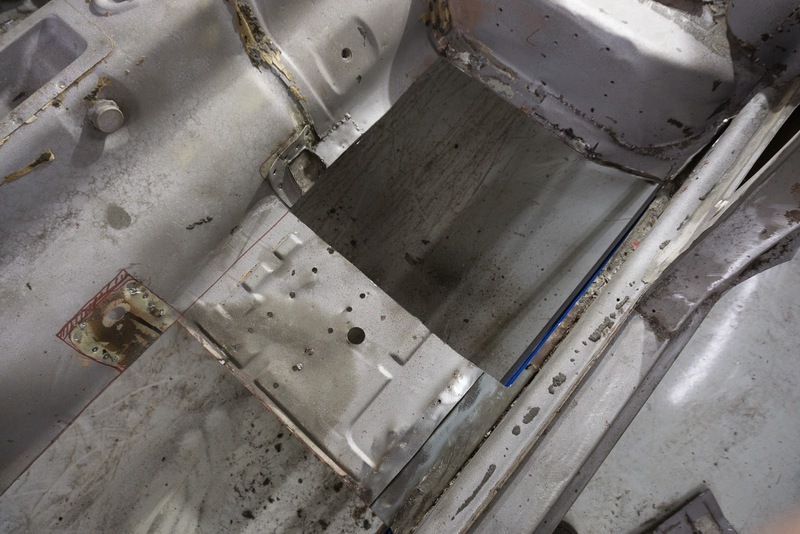 Luckily the weight is added to the floor and thus it can even make the car handle better in corners by lowering the center of gravity. That I at least hope!